The next step isn’t obvious, I thought, wondering about the next “Across The Prairie” blog post. So many wonderful people and happenings on the prairie to celebrate. Where to next? I asked a little prayer for insight before going to sleep last night. This morning my brain flashed a picture of a dog swimming. Huh?! Where did that come from? Well, “be careful what you wish for,” as they say. Just go with it, I told myself. So here’s how the conversation with myself went. What kind of dog? Irish Setter. Ever had an Irish Setter? Nope, but Grandma and Grandpa did. That dog would sprawl on the kitchen floor in front of the sink, and Grandma would step over her as she went about cooking. That wasn’t the only cooking hazard; she carved hams and turkeys using a butcher knife pointed back toward herself. Cooking hazards aside, she was an amazing cook. My brother and I have many fond memories of good stuff from that kitchen. And dogs. Always a beloved dog or two in that kitchen. My brother’s birthday is this week. Remember our dog Rowdy, and the time Chad bailed him out of frozen water? They were bird hunting, and the bird ended up in the stream. Rowdy was a little Cocker Spaniel mix with a passion for hunting. The bird went into the drink, and so did Rowdy to retrieve it. But the water was cold and icy, and there was a current, and the bird was heavy and almost bigger than Rowdy. But Rowdy possessed the canine equivalent instinct of a Navy Seal — never quit. So as the little spaniel was going under and floating away, my brother, with the critter loving instinct of our grandmother, waded in waist deep to retrieve his family member. And the bird. The dog wasn’t letting go. Mission accomplished. A mile and a half from home. No phone or vehicle. Soaked in icy water on a cold day. Nothing to do but keep walking. My brother tells how he finally arrived home, carrying Rowdy, at the back door, shivering cold and frost-coated. Our mother spotted them and came running with a warm towel from the dryer– for Rowdy. “Oh, poor Rowdy!” To this day, my brother finds humor in that little dog receiving all the love and care while he stiffly made his own way to a warm shower. Grandma always made my brother and me an ice cream roll for our birthday. We loved it. For our birthday week, we’d open the freezer to find a big foil-wrapped roll of vanilla ice cream spirals in spongy, chocolate cake. It was always a little sad when we opened the door only to find that super scrunched and wrinkly bit of foil clinging to the last chunk of frozen cake. I inherited her mixing bowl, flour sifter, jelly roll pan, and her recipe. I’ve tried it since, but can’t seem to keep from skinning it. Grandma always had a nice little crackled layer over the cake. Mine peels off when I dump it from the pan to spread the ice cream, exposing the sponge structure. My brother has said, “nice effort, but not Grandma’s.” My aunt said at Christmas that Grandma flipped hers out of the pan onto a flour sack towel. Why hadn’t she mentioned something before? I hadn’t asked. My grandma’s scratch recipe for our favorite birthday treat. So it goes from swimming — or sinking, dogs to birthday cake. 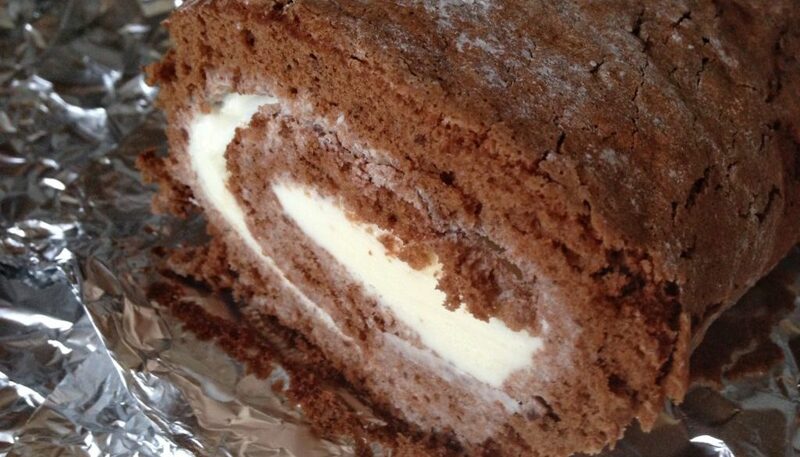 Today it seems I’ll be making Grandma’s Ice Cream Roll. I’ll get it just right this time. I’ll put one in the freezer at my brother’s house for him and his family to enjoy. That likely includes the dogs, who will get chunks of vanilla ice cream that have been carefully extracted from the not-good-for-them chocolate cake. I’ll just do that and see where the current carries me from there. My lessons? Turn out your jelly roll cake on a towel. Sometimes everything we need to know isn’t written down for us. Listen for insights from others. Appreciate the simple gifts that are a dry towel, a warm shower, or a birthday treat. Adventure with friends on whom you can count when the going gets tough, or the water gets deep. Pursue your passion. Keep going. Don’t worry about the next step, just take it. Dogs get it. Best wishes for the next step in your life’s adventure! 4 large Eggs, separated Separate the yolks and whites into two bowls. 1/2 cup Sugar Yes, this is in addition to the 1/2 cup of sugar used in the dry ingredients. 2 Pints Vanilla Ice Cream Remove from freezer to soften while you make the cake. Sift flour with cocoa and 1/2 cup of sugar. Three times. Set bowl aside. Add the salt to the egg whites and beat until whites begin to pile. Add 1/2 cup sugar in 2 Tablespoon portions, beating after each addition. Continue beating until mixture is shiny and forms stiff peaks. Beat egg yolks until light and lemon color, gradually adding water and vanilla. Fold dry ingredients into yolk mixture until well blended. Then fold yolk mixture into whites. Pour into a jelly roll pan that has been greased on bottom, lined with wax paper and greased again. Bake at 375 degrees for 12 minutes. Cool. Dust top of cake with a light sprinkle of powdered sugar, if you prefer. Lay a clean, dry flour sack towel over the cake. Grab both ends of the towel covered sheet (holding the towel too) and flip over so the top of the cake is now resting on the towel. Lift off pan and wax paper. Spread the ice cream evenly across the cake. Lift one end of the towel to help get the roll started and repeat until all rolled up. Wrap in aluminum foil and freeze until ready to serve.